One of the biggest challenges of living in France as a NON-Frenchy is adapting and learning about the local nuances, customs and culture. This can easily be remedied by getting to know the locals but how do you do that? Easy, aside from trying to befriend every French person you meet you could befriend some neighbours during “Neighbours day” known in French as “La Fête des voisins”. Bam, problem solved! Pronounced / la fet day vwo zain /. 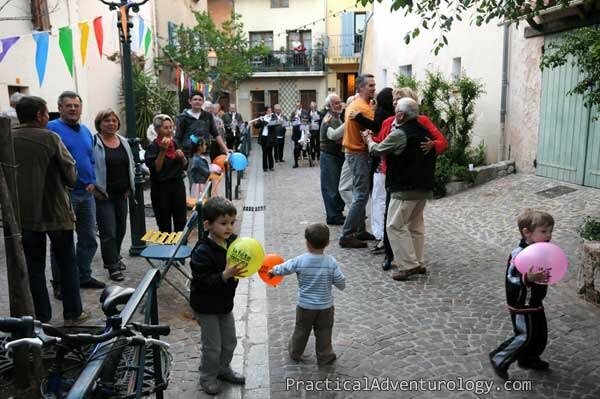 La fête des voisins, known as neighbours day in English is similar to a block party. On or around the last Friday of May, you gather with people from your neighbourhood at a designated area during l’heure d’apero (cocktail hour around 6 p.m. in the evening) to eat, drink, be merry and to get know your neighbours a little better. There aren’t really any formal rules so anything goes but usually their is music, festive balloons and everyone is encouraged to bring something to eat or drink, like you would to a potluck or block party. Some popular things to bring in France are quiche, cheese plates, anchoiade, tapenade and tabouleh salad and of course wine. Why bother to meet your neighbours in France? In the early 90’s, an elderly woman’s body was found in her Paris flat four months after she died. No one noticed, not even her neighbours. Unfortunately, this type of thing occurs all too often. Atanase Périfan founder of La Fête des Voisins. A man named Atanase Périfan was so moved by this tragic event that he decided he wanted to right what was wrong in his area so he commissioned a survey which asked a very simple question. “What makes an ideal neighbour?” Sadly, the most popular answer was ”A NEIGHBOUR YOU NEVER SEE”. That pathetic response confirmed the lack of community spirit so in 1999, Périfan created an initiative to tackle the anonymity and distance between neighbours and help neighbours across France to meet, get to know each other so as to instill a sense of community and maintain strong bonds. Today It’s known as La Fête des Voisins. 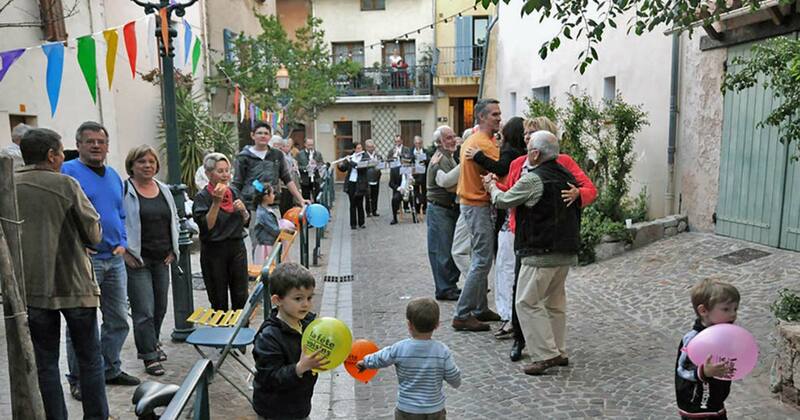 Blake in the orange shirt is dancing with me at our local fete des voisins. Most of us never really take the time to get to know our neighbours. Life gets in the way or an opportunity never presents itself and before you know it months maybe years have passed. Take it from me, it pays to get to know your neighbours especially if you live abroad in France. Our neighbours have given us so much insight into real French culture that you don’t normally get to see or learn about from guidebooks or from going to museums. 10 compelling reasons to meet your neighbours in France. Borrow things: It’s nice to be able to run to the neighbours to borrow little things like sugar or milk. We once borrowed a car and even a ladder. Local Advice: Guidebooks are good but sometimes your neighbours know hidden gems like best dive bars to eat at or isolated beaches. Kids have a place to go: Some of your neighbours may have kids the same age as yours. Emergencies: Neighbours can help you out in an emergency situation. Do favours: They can look out for your property or gather your mail when you leave for a short trip. Connections: You never know who your neighbours can put you in touch with. We have found music teachers and calligraphy teachers all through talking with neighbours. Camaraderie & Friendship: It just feels good to have friends. A sense of belonging: This is just plain human nature. This can also help you adapt more easily in France. If you’re ever in France at the end of May, make sure you ask some neighbours where the Fête des Voisins is being held. I guarantee you’ll have a blast when you meet your neighbours in France. Just make sure you bring something to eat or drink. Why stop there though? Getting to know your neighbours and bringing people together to create a sense of community and solidarity is a good idea everywhere not just in France. So look to see if there is a neighbours day in your area. 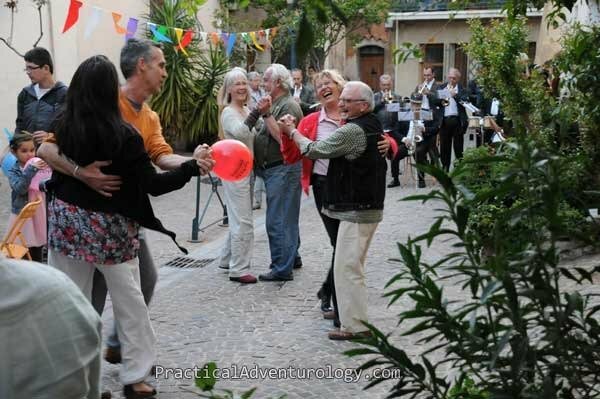 Since la fete des voisins was first born over 15 years ago, it has spread to more than 36 countries around the world with over 16 million participants. Sorry, I don’t think it’s caught on in the US but it has in Canada and mayny European countries.